On the morning of Nov. 1, the reddish-orange orb of Mars will pass through the middle of the Beehive star cluster. This map shows the sky as you face southeast, about halfway between horizon to the zenith (the point directly overhead) at 4 a.m. ET from mid-northern latitudes. The field of view is 5 degrees, similar to a 10x50 binocular. There?s a special treat waiting for you this Halloween. Remember how, in the Peanuts cartoon, Linus would waitevery Halloween forthe Great Pumpkin to appear in his pumpkin patch? Well, this Halloween there isa nice big orange pumpkin of sorts right in the middle of the Beehive starcluster in Cancer. To receive this treat, all you have to do is stay up pastmidnight on Halloween and look for the planetMars, now becoming quite bright at magnitude 0.4. If you haven?t looked at Mars lately, you?ll be surprisedat how bright it?s grown. It now equals the bright star Betelgeuse inbrightness, shines significantly brighter than nearby Castor, Pollux, andRegulus, and is exceeded only by Sirius (the brightest star in the sky),Capella, Rigel and Procyon. Mars typically appears orange or ruddy compared to otherplanets and the stars. In a small telescope, it becomes a fuzzy orb rather thanjust a point of light. 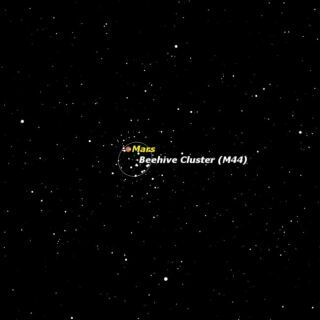 Zeroing in on Mars with binoculars or a telescope will showthat it is embedded in the beautiful open star cluster, number 44 in Messier?scatalog, known as the Beehive. At 590 light-years distance, it is one of theclosest star clusters to the sun. It?s also unusual in that it shines brighterthan any of the individual stars in the its constellation, Cancer. The Beehive seems an appropriate name, since the clusterresembles a swarm of glowing bees. Its alternate name, Praesepe, is a bit morepuzzling. It is Latin for ?manger? and relates to an alternate version of theconstellation Cancer, where two nearby stars, Asellus Borealis and AsellusAustralis, are named for donkeys, gathered around the central manger. If you observe Mars with a telescope, take careful note ofits exact position against the background stars of the Beehive, perhaps makinga simple sketch. An hour or so later, check the position again, and you willsee that it has moved slightly. There?s even a chance that from your particularlocation Mars, in its orbit around the sun, will actually pass in front of oneof the Beehive?s stars, causing an occultation. Besides growing brighter, Mars is also increasing in sizeas it moves towards opposition, the point opposite the sun in the earth?s sky,on 2010 Jan. 29. At present StarryNight shows it to have a diameter of 7.9 arcseconds at a distance of 1.182astronomical units. 7.9 arcseconds is only 0.4 percent of the moon?s diameter,equivalent in size to a tiny crater on the moon. An astronomical unit is theaverage distance from the Earth to the Sun: 93 million miles, making Mars 110million miles from Earth. By Jan. 29 it will have almost doubled its size to adiameter of 14 arcseconds at a distance of 0.664 astronomical units, a mere 62million miles away. The coming opposition of Mars is known as an aphelicopposition, since it occurs close to Mars? aphelion (its greatest distance fromthe sun). Compare its size with what it was in August 2003, a very favorableperihelic opposition: 25 arcseconds and only 0.373 astronomical units away.